Ok A.net, I am hoping I can jog your collective memories with this one to help find something I am looking for. I remember back in the late 90’s, Delta had produced a number of commercials to Enya’s song Adiemus. Most of the ones on YouTube end with a big circular window looking at the sky which I am pretty sure is ATL’s main terminal. But I remember I recorded one on VHS of it ending with a birds eye view of the Worldport saucer at JFK. I think that commercial run may have been specific to New York, where I was living at the time. Anybody else remember this or have any idea where I can find this? Side note - my toddler aged son seems to have found a love of old airline commercials so if you feel like suggesting some other good ones for us to watch, feel free! The name of the group, the album, and the song are all Adiemus. Maybe dropping Enya from your search will help. Delta mailed copies of the entire album to some customers. My dad got one as a Flying Colonial. An unfortunately common misconception, but Adiemus has nothing to do with Enya. It is a work by Welsh composer Karl Jenkins, who went on to produce a series of Adiemus albums with the same concept of the voice as a pure instrument singing made-up syllables/words. The song Adiemus actually premiered in the 1994 Delta commercial prior to the release of the first Adiemus album “Songs of Sanctuary” in 1995. Sorry, I haven’t seen the particular version of the TVC you are looking for. British Airways' 'Flower Duet' advert from 1989 must rank as one of the best commercials ever, and certainly the best for an airline. I believe this is what you are wanting to see. This is it. I remember seeing it on TV from about '94 or '95 and loved it a lot. In the end I even went as far as buying the CD single that was released. 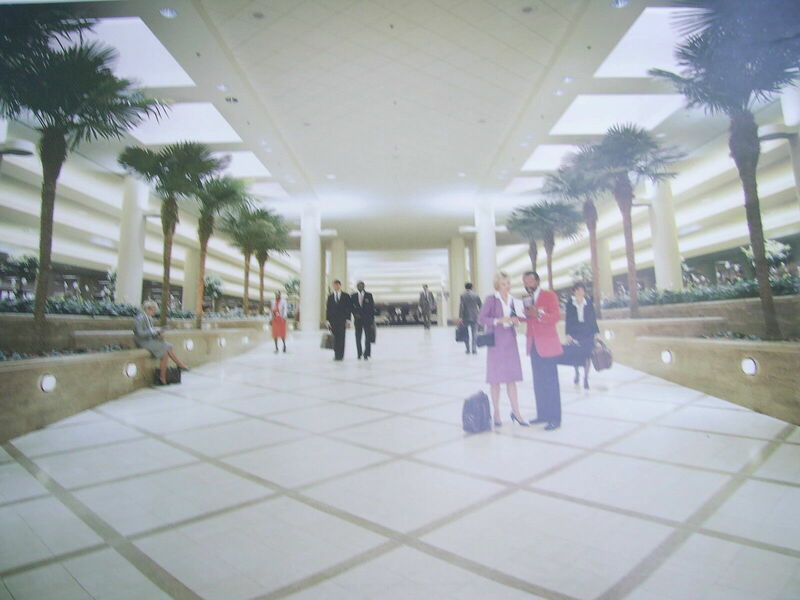 The video was made at Delta's former terminal at LAX. You beat me to it! Yep, that shot was at T5's main lobby. The Adiemus ad came out in the early 90s, just shortly after Delta purchased T5 from Western Airlines. They renovated it in '88, adding the white marble (I think). It was called Delta's Oasis--marketing material said "Take Five at LAX." Post-9/11, the lobby was filled to the brim with TSA checkpoints but it was still a treat walking through and seeing that beautiful clock--naturally, I never saw a plane fly past the dome! While somewhat unimpressive nowadays, I imagine when T5 opened it very much felt like an oasis. T3 is architecturally less interesting, IMO. But Deltas' decision to move makes sense. On a somewhat related note--while boarding a Delta 757 from SXM-JFK.. Adiemus was playing at the gate area! This was in 2014, so a very nice treat. The only time I've heard Adiemus in public. Sorry to slightly derail the thread. Just have a lot of nostalgia for T5 as a native-Southern Californian who flies Delta a lot. Lots of good memories, and the starting point for so much. Delta's Oasis is just about as old as I am, and it was sad day when Delta moved out. Comments made here reflect only my personal opinions. Aside from removing the wavy-gravy livery, I think the worst mistake delta made was getting rid of Adiemus, which I believe they actually commissioned in the first place. I loved being on hold with them just to listen to the music, and to this day, Songs of Sanctuary will blare in my headset the moment I sit down in my Delta seat, almost 25 years later. As one of the other writers pointed it, the music was composed by Karl Jenkins, he put out several discs and there is a recording of Adiemus Live out there somewhere. Jenkins has no connection to Enya, who invariably will be my second set of music once the drink trolley comes out somewhere over Northern Alabama. Delta, are you listening? (Yeah, right!). Bring back Adiemus - looking forward to listening it to you in the front section of the new 789s. I remember that Delta “syncronising” commercial! I remember that commercial you mention, but I don't ever recall seeing a version of that commercial which included shots of the JFK Worldport. Like you, I suspect that could well have been an alternate version of the same commercial intended for the NYC market. I had bought the CD when I first heard this song, but it was not from the commercial, but a jazz station. Still have Adiemus on my iphone, played it walking from concourse A to C at ATL short time ago, makes for great walking music.